+1 Defense. If Takanosuke successfully defends the attack, he may automatically escape combat and use Action Points to move as a Reactive Action. Distance (12 inches). +2 Attack. If Kage Shuriken causes damage, target unit suffer Lv1 Paralyze. Effect 15. This skill can be used only if Takanosuke is Hidden. +3 Attack / +3 Damage. This skill can only be used if Takanosuke is Hidden. A part of Team Kujaku Hime & Takanosuke along with Kujaku Hime. Takanosuke is the son of Kage Yagura, the head of the great clan Asakura ninjas. Childhood friend of princess Kujaku, he has being ordered to bring her back to the main house by any means, but after discovering her fate, he has decided to go along with the princess in her quest to halt the awakening of the Dark Aeon Orochi. 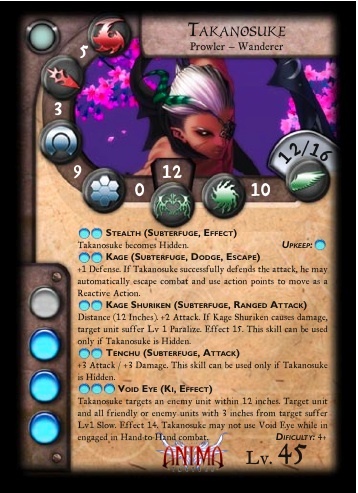 Takanosuke, whose veins flow the blood of a war Kami, has mastered the power of the Void Eye, a fearful power which enable him to absorb all live around him.